Injen has finally released the long awaited SP series cold air intake system for the 2008-2014 Mitsubishi Evo X. After several months of solid R&D, we are confident to say that this is by and far the best complete cold air intake system available for this vehicle, yielding superior horsepower results and flow increases. 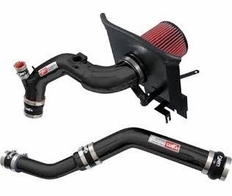 You'll see from the photo above (click to enlarge), that the Injen Cold Air Intake for the 2008-2014 Evo X comes with more than just a pipe and a filter. Your mass air flow sensor bolts right up to it for a flawless install, it includes additional piping upgrades, a heat shield, a high quality air filter, and more! What Makes Injen Intakes better than their competition?Not only are all Injen Technology Intakes made in the USA, Injen cool air intake systems feature MR Technology, developed by Injen to maintain safe air/fuel ratio and highly efficient tuning. Injen also does extensive dyno tuning and r&d before releasing an intake, unlike many other companies who take an "if it fits, use it" attitude to aftermarket intakes. This Injen Intake is also 50 State Legal. The CARB EO Number is D-476-5. If you find a better price, call us and we will match or beat the price, and ship it the same day! The part number for this item is SP1899BLK and it fits 2008-2014 Mitsubishi Evo X models.